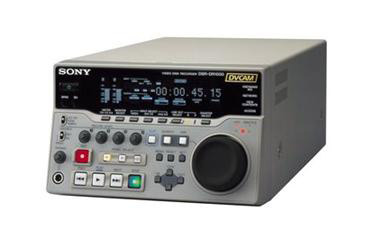 Sony is please to introduce the new DSR-DR1000A DVCAM Master Series Hard Disk Recorder. This new recorder enhances the capabilities of the previous DSR-DR1000 by offering an increased total recording time of 12 hours, and improved disk protocol support for added versatility in remote control applications. Primarily designed for recording and edit feeding applications, the DSR-DR1000A takes full advantage of the benefits of disk-based recording while maintaining the same operational feel as a VTR. The DSR-DR1000A can simultaneously record and playback, allowing a recording to be available immediately for play out and other feeding purposes without interruption. An i.LINK connector supports both the SBP2 protocol for DV file transfer and the conventional i.LINK (DV) protocol (AVC protocol). The SBP2 protocol allows DV files on a DSR-DR1000A to be transferred to other compatible equipment at high speed. The DSR-DR1000A also offers the convenience of high-quality digital jog sound, and slow motion playback over a wide speed range. Providing unique disk-based features at an affordable price, the DSR-DR1000A is an excellent choice for implementing disk-based technology into production suites. Increased Recording Time: Improved capacity from previous model (DSR-DR1000). Total recording capacity of 12 hours. Improved control protocol: Seamless repeat playback of clip segments. Supports "Open Play Command" ENDLESS mode. Not available via front panel operation--must use a remote controller.